If one day you are tire d of living in your urban area with crazy noise and industrial smoke, take a journey back to Kinh Bac region in Bac Ninh Province to enjoy the nostalgic atmosphere and ancient scenery of old pagodas with some existing for over seven centuries. A recommended destination that tourists should not miss is But Thap Pagoda which is located in But Thap Hamlet, Dinh To Commune, Thuan Thanh District in Bac Ninh Province, about 30 kilometers from Hanoi. The sanctuary will bring to visitors peace and comfort right from the gate leading to pagoda which is shaded by ancient giant banyan tree lines. The pagoda was constructed in the 13th century during the Tran Dynasty and rebuilt in the 17th century during the Ly Dynasty. 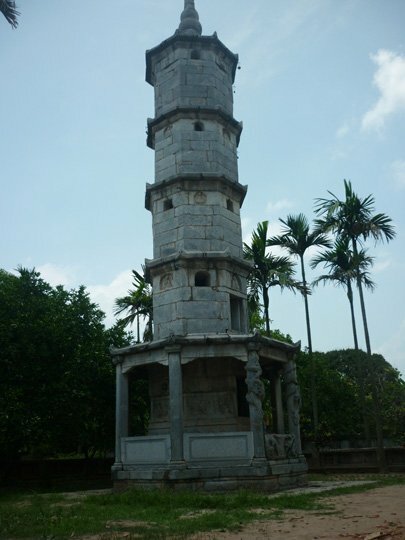 This is one of the most popular pagodas in the north of Vietnam and is known as the center of Buddhism. The pagoda has 10 buildings spreading for 100 meters from the three-entrance gate to the bell-tower and back house. But Thap is constructed according to the “Noi Cong Ngoai Quoc” architecture style with more than 100 compartments. There are two 13-meter-high towers of Ton Duc and Bao Nghiem which are made of white rock, making the pagoda seem higher and more majestic and peaceful. Some remains of the 17th century are kept in here such as the statues, valuable donations, nine-storey Lotus Tower, Tuyet Son Statue, Bao Nghiem Tower, and Xa Ly Tomb. The last renovation of the structure was carried out in 1992. Step in the pagoda, passing the three-entrance gate and an eight-roof bell tower, visitors will reach the main temple complex. Inside the temple are more than 50 statues. The most remarkable is the thousand-handed and thousand-eyed Guanyin, which is described as a sculptural masterpiece of Vietnam. Thap Pagoda has been recognized as a national cultural historic relic, which makes it an important place for pilgrims and also a tourist attraction. Bac Ninh is an ancient town and was the trade center of Vietnam from the second to the 10th century when Buddhism penetrated there early and flourished during the Ly Dynasty. So many other pagodas and temples were built such as Phat Tich, Dau pagodas, Dinh Bang Communal House, and some tradition handicraft villages such as Dong Ky Wood, Dong Ho Pain, Dai Bai Bronze, and Phu Lang Pottery and of course Do Temple. So, tourists will surely have an amazing experience to explore old architecture and to find balance and peace for their soul, casting away all daily cares.